Two lakes totalling around 150 acres make this the largest fishery on the MKAA ticket. Its a specialists anglers Mecca with double figure bream, tench over 8lb, pike topping 30lb and rudd, roach and perch all topping the 2lb mark. The north lake also has plenty of carp reaching the mid 20's and at-least one cat. The south lake has its fair share of whoppers, but it also holds hordes of pleasure catch sized roach and skimmers too. Both lakes are open all year, although keep nets may not be used during the traditional closed season. H6 bank 'A' section - Fishing 24/7 November 1 to day before Good Friday, NO fishing Good Friday through to October 31. Temporary 'bandstand' swims were withdrawn last year and no longer exist. H5 bank 'D' section: the new sign marking limit of normal fishing is being/has just been moved a bit nearer to the ski tow to slightly increase the length of bank open to card/dayticket holders 24/7 all year in that area. West of that sign (in front of ski-tow) is no fishing for dayticket/season ticket holders...unless, in the case of SEASON ticket holders, they have ALSO joined the Beaches Syndicate, which is now open for membership. The Beaches swim area will be marked by two wooden stakes. 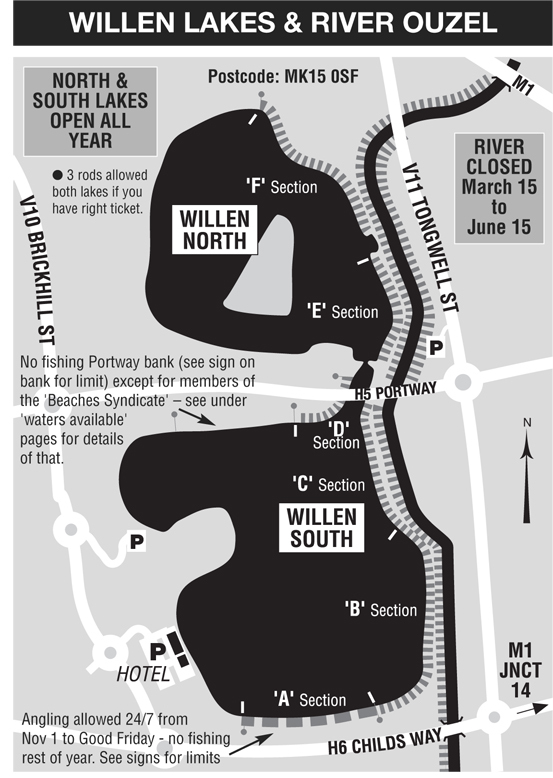 Members of the syndicate will be able to floatfish/freeline from the limit sign (end of 'D' section') to the first peg marking the start of the Beaches during daylight only. They will also be able to fish any style (by rota or a system of their own choosing) the Beaches 24/7 all year round. A new line of buoys close to the ski-tow/boating area mark the casting limit. The new syndicate will be 'no charge' (as with the Lodge night syndicate) but members will have to have photo ID and commit to sharing bailiffing that section of bank and keeping proper records of who fishes where and when. If there is insufficient interest to form such a syndicate then the beaches will be off-limits to all. If it should be over-subscribed then a waiting list seems to be the logical answer.